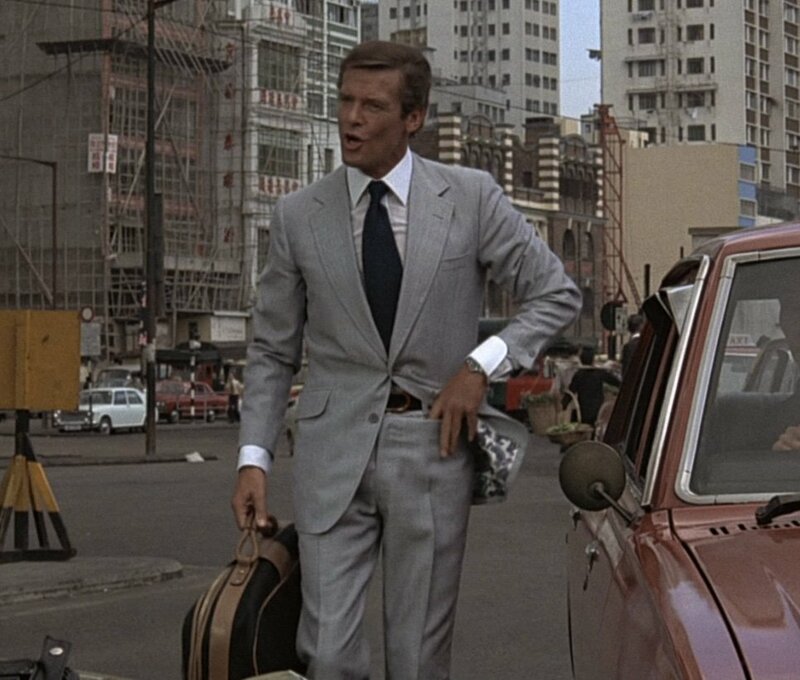 In Hong Kong in The Man with the Golden Gun, Bond wears a sporty silk or silk-blend suit made by Cyril Castle. Roger Moore says on the DVD commentary for The Man With the Golden Gun that Angelo made this suit, but it unmistakably has Castle’s cut and style. The cloth is semi-solid blue-grey and white with white stripes. Sometimes it looks light blue and sometimes it looks light grey, but in general it’s a cool grey. The suit is Cyril Castle’s standard button two style from that era, with slanted pockets, deep double vents and flared link-button cuffs. The chest is cut with a little drape, which is especially helpful here since silk doesn’t have much give. The lapels have swelled edges, making it a rather sporty suit. The trousers have a darted front, flared leg, and large coin pockets on both sides of the trousers accessed from just below the waistband. The soft white cotton voile shirt made by Frank Foster has a spread collar, front placket and two-button cocktail cuffs. The matte navy tie has a rough texture that would suggest a linen and silk blend. The tie is knotted with a four-in-hand knot. Bond wears black Gucci slip-on shoes with an apron toe and side bit detail and a black belt with a rounded, center-post brass buckle, most likely from Gucci as well. Roger Moore wore this suit a lot outside of The Man with the Golden Gun, like in this interview for The Spy Who Loved Me. One of Moore’s best “fashionable” 1970’s suits – not to mention the perfection which is Foster’s shirt (large collar or otherwise, it does its part perfectly). As always, expertly cut by Castle, and the color offsets any of the fashion-forward trends applied here. Not sure I’m keen on the slightly bowed lapels, but it’s only obvious in the taxi shot. Looks as if the pants have fallen a bit during said taxi shot – even with Rog’s raised shoulder, I would have expected less space between the belt and the upper button. It’s not as if the button stance is unreasonably high either. This is one ot Moore’s finest fitting suits of his bond tenure. I think that bit of drape suits his physique better than clean. The trousers appear to fit much better around the thighs too. Whenever he wears more sporty/cavalry trousers they seem a bit tight. This suit with the shirt and tie is pure sartorial bond. It can obviously be dated to early 70s but then that’s just fine. I have seen stills of this suit from “The Man with the Golden Gun” which show Moore wearing a navy tie with polka dots which actually gives the whole outfit a bit more bounce (for want of a better word). Yes, beautiful. And Maud Adams complements it very well too! Looks lovely in general. The colour, lapels, and collar all stand out. Only thing that looks off (to me) is the length of the jacket sleeves. Seem quite short. Maybe it’s just the pictures. They seem about right in the first screenshot, but the second does show the right sleeve pulling up a bit more than I’d anticipate. Any chance the cocktail cuffs are latching onto the sleeve lining and pulling it up? This has always been one of my favorites. It does show a few signs of its time, but its so nicely cut, I’d be proud to wear something like it even today. Never been crazy about the lining, obviously. I had thought that this was the suit with the bright paisley lining, but the second picture seems to suggest that I’m wrong. You’re right, Chris – the sleeves do seem a little short. This is one of my favorite Moore looks. I’ve always thought that Moore looked his best in The Man With the Golden Gun, and I certainly don’t blame him for keeping a suit like this for personal use! Kyle, interestingly, this wasn’t the only suit from TMWTGG that Roger coveted but this one he obviously succeeded in getting home and dry after filming wrapped. He refers in his book “Bond on Bond” (recommended by the way and a very entertaining read) to a suit from that movie which he particularly wanted and which was used in the final scene (I assume the final scene filmed, so I’m not sure which suit this was?) and him taking great care that the garment wasn’t harmed in any way during shooting the scene. Finally, dusting himself down and congratulating himself at securing his prize he was the recipient of a dose of liquid from above dropped down on him by Cubby Broccoli as a joke and therefore scuppering his chance of “acquiring” this particular suit for the future! It’s interesting how much Gucci is seen in this film. Bond’s belt, shoes and suitcase! Furthermore, both Goodnight and Miss Anders are using Gucci handbags too. Yet I have never seen any commercial ads or tie-ins connected to the film? R. Sterling/James, thanks for the info. That suit was my suspicion anyway and I can only, as always, complement Sir Roger on his impeccable taste. It was a beautiful suit and in fact, a Marine Blue is one for my future wardrobe! It’s one look that seems to have achieved universal approval here (not always easy!) and definitely due a revival. Superb colour and Roger never looked better. I am surprised no comment has been made on the jacket lining. Very nice, though I too am not a fan of the slightly bowed lapels. Reflective of the era without being overwhelmed by it, perfectly cut. That lining is something! Pure elegance and almost nothing to critique here. Sir Roger at his sartorial best. Flared trousers aside, I think we could realistically see Daniel Craig wearing something similar to this in his next outing if the costume designers would allow Tom Ford’s to dress the character in his signature style. Isn’t the tie he’s wearing in the youtube link from the “where’s Fekkesh” scene in The Spy Who Loved Me? I think it is. Like the suit, perfect for the era and location. Lining, briefly glimpsed, is a bit loud but we’ll forgive him. It’s a very similar tie. The colours look different, or just the colours on that video have been muted considerably. I think that’s just the lighting, it is definitely the same tie, he wore it quite a bit promoting the film (I’m sure they had mutiples). I don’t know about anyone else but my love of striped silk ties is entirely down to Sir Roger. As usual, agreed, James. And of Frank Foster shirts too! One of my favorite suits from one of my favorite films of the series and certainly one of Moore’s best. The cut is trully excellent. Minus the flared legs (and the lining of course..) and with slighlty smaller lapels, this suit could easily be worn today, although I don’t know whether this colour can be found off the rack. The Cyril Castle cut of the first two Moore films as well as the Dimi Major one for Lazenby belong to the sartorial highlights of the series IMO. Superb cut for the suit. In fact, curiously, the whole look (colours association and details) looks like a 70s-reinterpretation of the “Connery look” -I know some people will find it controversial, but whatever-, with more twist. 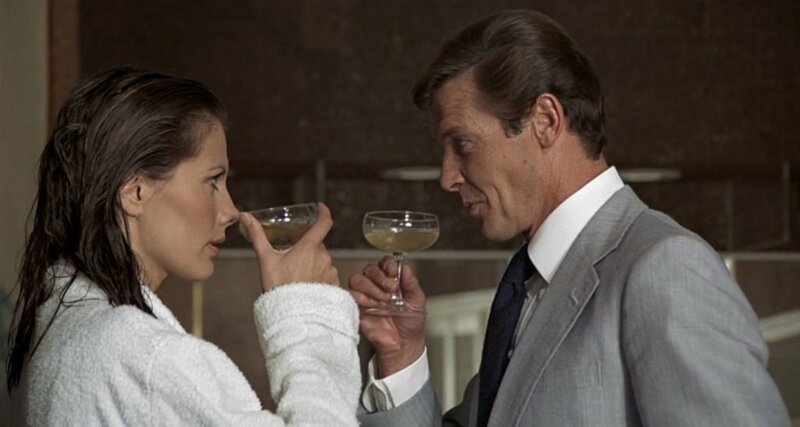 Silk suits are indeed very nice, like the ones in Moonraker and in FRWL. I just find this fancy lining out of place. I know you appreciate this feature Matt, but I think it’s rather a flashy option to show that your suit is bespoke. I think the opened buttonhole of the sleeve is more discreet, even if it serves no purpose at all. I wonder if the fabric could have been one of those terylene wool blends–given the sheen– that were then produced by Dormeuil and Scabal back in those days. They were rather pricey fabrics. I believe the sheen is from silk, considering the slubs. I can’t believe this suit gets a free pass from pretty much everyone here when Daniel Craig’s Skyfall suits are generally torn apart. If you tried wearing this suit today you would be laughed at, it’s just as much of it’s time as Craig’s short jackets and slim lapels. It’s well tailored (although I’ve never been a huge fan of the drape cut) but that doesn’t excuse the extremes to which this suit is clearly influenced by 1970s fashion. Sorry, I don’t like it. What do you find “laughable” about this suit? Personally, I find it to be one of the best suits from the entire series. I don’t agree that this suit is extreme, but it is clearly of its era. I do agree that one would look a little odd wearing this suit today (a controversial belief here, I know). And some of the Bond actors get a lot of slack on this blog, while others can seemingly do no sartorial right. If Daniel Craig were born thirty years earlier and playing Bond in 1981, would we be praising his “timeless fashion”? 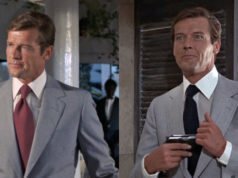 If Roger Moore were born thirty years later and playing Bond in Skyfall, wouldn’t his demonstrable fashion forward sense from his pre-Bond days lead us to believe he would be wearing suits at least as trendy as the suits in Skyfall? The suit has a style and cut of its era which you either like or don’t like. The colour and fabric are what make it so appealing, in my opinion, and is still the sort of suit you would find in Paris , Rome or Madrid today. You would really struggle to find that sort of thing in the UK today because we Brits are innately conservative and a little shy of looking more flamboyant than normal. For a Latin, the look would be absolutely normal. I agree – this is one of the best outfits in the entire series – except for the flared pants it would be excellent even today. Slightly wider lapels and angled pockets on an otherwise timelessly well-cut suit define an extremity? Gee, I hope you didn’t see the safari jacket. The Moore’s suits in “The man with the golden gun” are fantastics! The best of the Roger Moore’s wardrobe as Bond. But what is a “darted trousers”? Is a sort of compromise between pleats and flat front? And what serves darts in front ? To begin and keep the line press of trousers? Cyril Castle puts a dart in the front where the main pleat is on pleated trousers. More often darted trousers place the dart further to the side in front of the pocket. The dart serves a similar fucntion as pleats do: to provide the much needed fullness across the hips. It’s often necessary for a good fit for trousers worn at the waist. True flat fronts are often the compromise to have something cleaner at the cost of comfort and fit. Flat fronts are only ideal for someone with a lack of hips. About the lining (BTW I love it!) I think there is a similar one on Connery’s light grey Vegas suit in DAF (see the wig in the pool scene). I must admit I love that outfit. I also see it as an update of the Connery-Bond look. I had to wear a suit on Saturday to interview candidates at my local business school (and alma mater) and quickly found what to wear upon seeing your blog: my light grey 2-button suit with slanted pockets, lapels on the wide side, flat front tousers and horse-bit loafers complemented with a white shirt and navy tie. Thanks to your blog I had my little Roger Moore moment! Mark, while I fully respect the fact that you don’t care for this particular suit, I think it’s fair to say that only Daniels Craig’s most recent, “Skyfall” suits were, as you put it, “torn apart” on this blog. This is due to the fact that they just don’t fit him correctly. I only speak for myself obviously but these and Daltons 1989 suits, therefore, were the least successful examples of tailoring in the entire Bond series and while I don’t care at all for any of them I don’t see anything to laugh at. Apart from bad manners, laughing at how someone else chooses to present themselves is a sign of insecurity on the part of the person laughing. As FS correctly points out above this style of suit is not all that far removed from Tom Ford’s signature style and he dresses the Bond you admire. So, would you still find it a cause for mirth if Craig wore a similarly styled outfit? Kyle, I agree with your impression that Moore would be the easiest of the Bond actors to work with and, I think, his likeability and the enjoyment they had working together wasthe main reason that he stayed in the role for so long. Moore claims it was because Broccoli couldn’t find another actor who would work as cheaply as him! The man’s affability, charm and innate gentlemanliness shined out when he played the role and this made him, in my book, the most entertaining of the on screen Bonds. Completely agree with you, David. Matt too pointed out some similarities of the Tom Ford style with an outfit Moore wore in the 70s -a 3-piece suit with wide peak lapels, perhaps a long rear vent, of a blue-grey colour I think. Quite a flamboyant style, exactly like Tom Ford’s style -and not at all like the suits of Skyfall, who lack that flamboyance a lot. 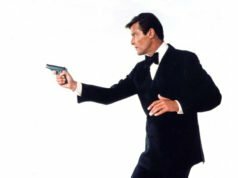 About Roger Moore, well, having never met him, I will not risk a judgement about him being more or less easy to get along with than an other actor. But I must confess I feel the same way about some actors I admire -not Bond actors by the way. I think this is one of Moore’s best looks. The fabric is unique without being flamboyant, and the colours are classic film!Bond. As for the debate on the details, wider lapels are a terrific look on Moore since they help to downplay his broad chest. They’re a lot better than the narrow lapels he wore in the ’60s, which were really unflattering. As for the flares, they could always have been taken in once they went out of fashion. Funny, I always thought wide lapels were good on slim or skinny people too, since they help making the chest looking more full, more “occupied”. But I agree that these wide lapels are also very flattering to Moore. As a matter of fact I don’t find them very wide, just on the wide side of classic. But they are surely wider than Connery’s 60s suit lapels, even in Dr No. Moore wore slimmer lapels again in the 80s that looked very nice on him too. Perhaps it’s the combination of drape + skinny lapels + narrow trousers that doesn’t look good. What is your opinion about “wide” lapels, Matt ? Do you think they flatter some people more than others ? Thanks for the link Adrien. She was a popular singer at that time. The tie he’s wearing here is the one I mentioned having seen in my first comment above. I find it gives the outfit more flair than the plain navy in the film. Thanks, Adrian. Great look at the suit. As an aside, I did not know that Roger Moore spoke fluent Italian. Given this fact, I supoose it’s not too much of a steetch to assume that he had an affinity for Italian culture, which sheds new light on many of his sartorial choices as Bond. His wife was Italian and he spent a lot of time there. It would explain the Angelo Roma suits in the late 70s, and perhaps he choice to go with the somewhat Italian-inspired Douglas Hayward. Matt, not forgetting the choice of footwear and accoutrements (Gucci in LALD and subsequently Ferragamo). Foster’s shirt style (as opposed to a rival shirt maker like T&A for example) which he produced for Moore has a certain Italian flair too with their tall, spread collar style. These lapels are not particularly wide,but rather on classics side. The tie is too much wide in my opinion. Same suit with a more moderate classic tie would be better. Is the tie,not the lapels in 70s fashion. The lapels are too wide to be considered classic, so are the pocket flaps and flared trousers. Also, I think swelled lapel egdes are for blazers and casual linen suits only, not on a suit like this. Other than that, I love this suit and the cut is, as said, perfect. It’s not Bond, but beautiful non the less, as is all of Moore’s clothes in the series. Couldn’t it be pick-and-pick ?! Yes, it could be pick-and-pick. I mentioned it’s a semi-solid, which pick-and-pick is an example of. I’ve long suspected this could be a pick-and-pick herringbone, but it’s just an educated guess. One of Bond’s best outfits and it’s an example of why Cyril Castle was Roger’s best tailor. I was wondering about the shoes he was wearing with this outfits and after looking at them, frame by frame, they appear to be dark brown Gucci horsebit loafers. …and the horse-bit is only barely visible when he’s walking through the hotel room. Regarding your comment on it being herringbone pick and pick, I doubt it. It doesn’t appear have the texture that herringbone does. Another thought, the shoes could be the same loafers he wore with the cream casual outfit, lending some realism to his wardrobe. I just had a closer look, and the shoes are black side-bit (not horse bit) slip-ons. The shoes are a different style than what he wears with the cream casual outfit. The shoes with the cream outfit are the classic moccasin-style loafers with the full horsebit while the shoes with this suit are a dressier apron-toe style. I could have sworn his tie in this scene was black. Or some shade of dark grey. Its really hard to find such dark Navy blue ties today!